Tonight, Date Night returns to the Marietta Square, where we have not been for some time. We last visited this part of Marietta when we dined at The Butcher, The Baker just over a year ago. 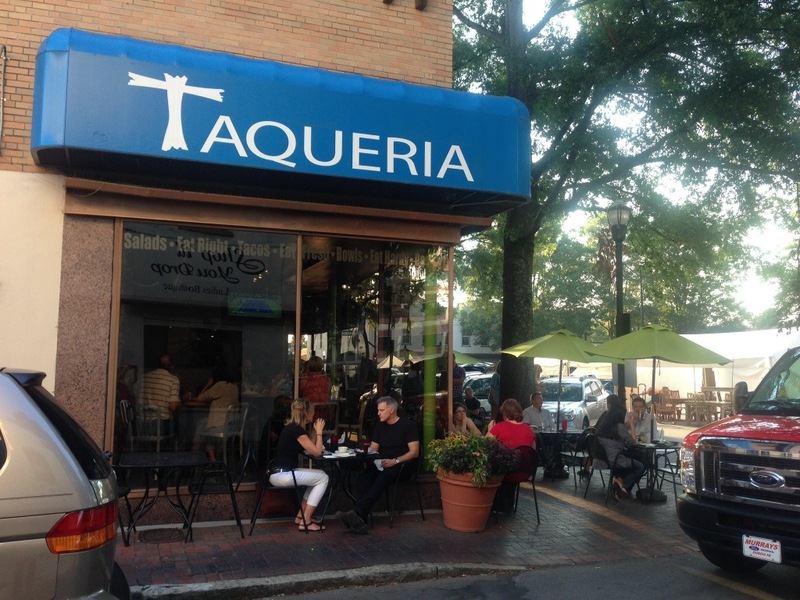 Taqueria Tsunami is across the square from The Butcher, right next to Marietta icon Eddie’s Trick Shop, which has been here forever. 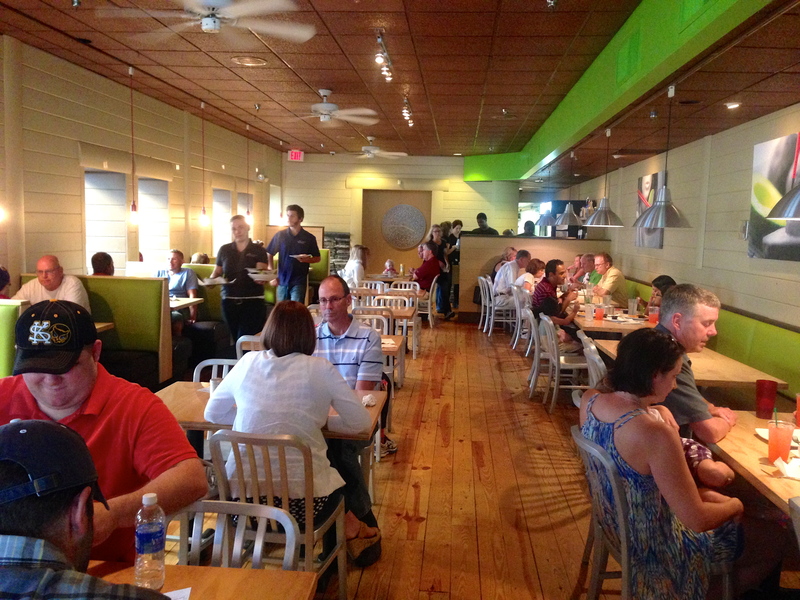 It used to be a Le Peep, which was always packed, but alas has been replaced by the taqueria. We have tried to eat here before, but could not get in due to the crowds. Because an arts and crafts festival has closed down many of the streets, we have a lot of trouble navigating the square and almost don’t get here tonight. 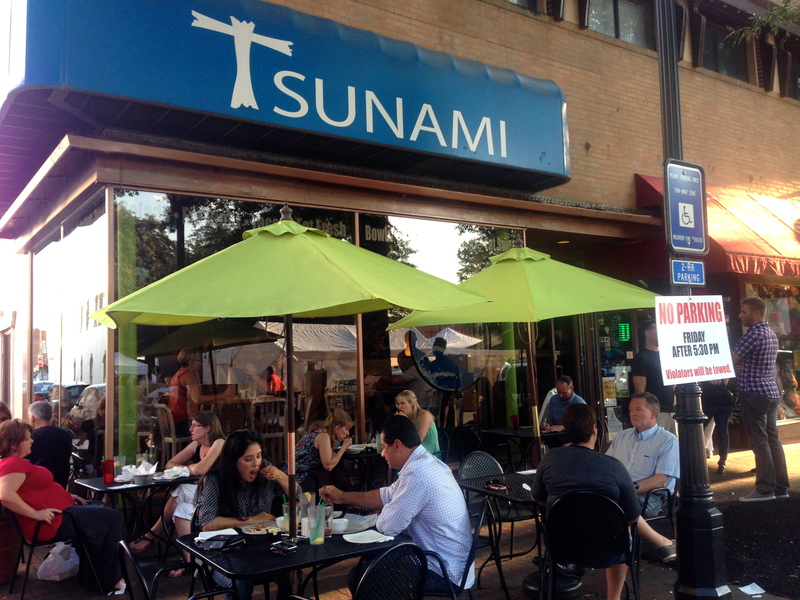 There are five Taqueria Tsunamis, three in Atlanta, one in Athens, and one in Kentucky. When we arrive, it’s pretty empty. By the time we leave, they are waiting in line, even though square access is a nightmare. 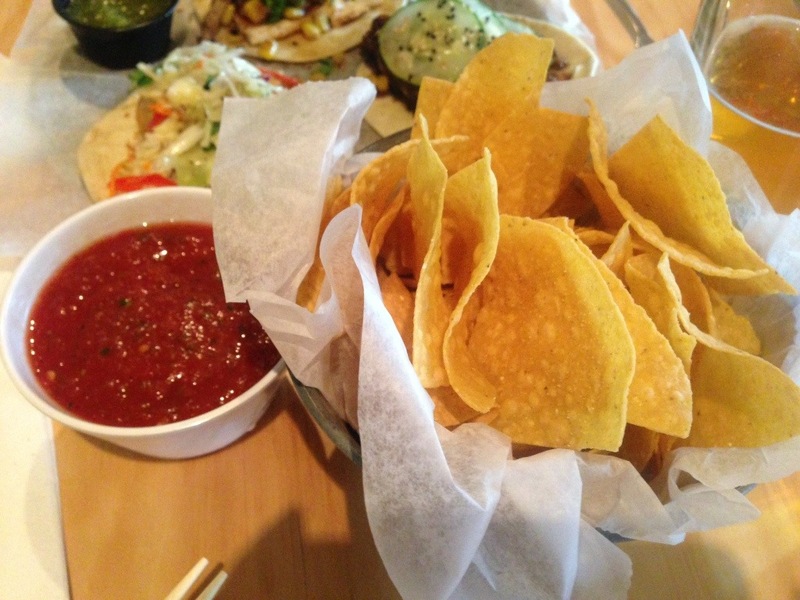 The menu can best be described as Latin-Asian. For every Asian dish, there is something Latin. Sometimes they mix them up. 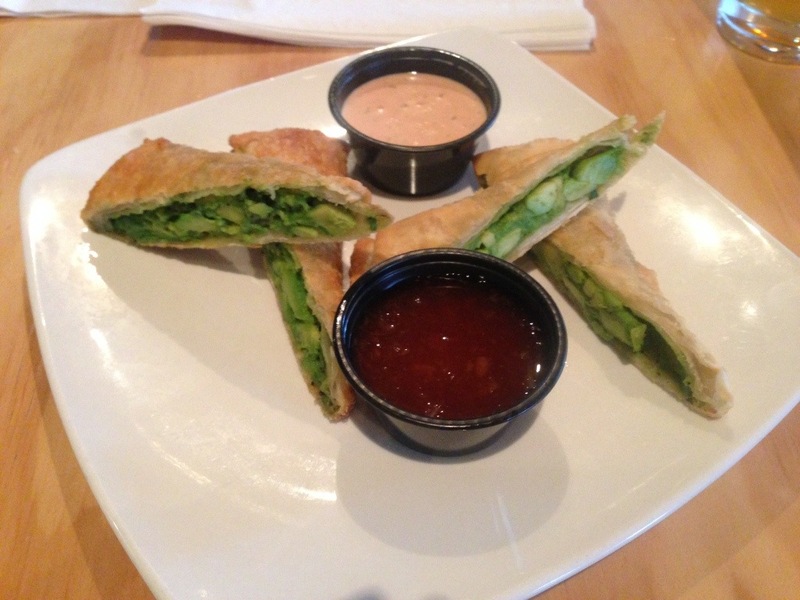 Like these avocado egg rolls. Why not take avocado and put it in a crunchy egg roll? It works. 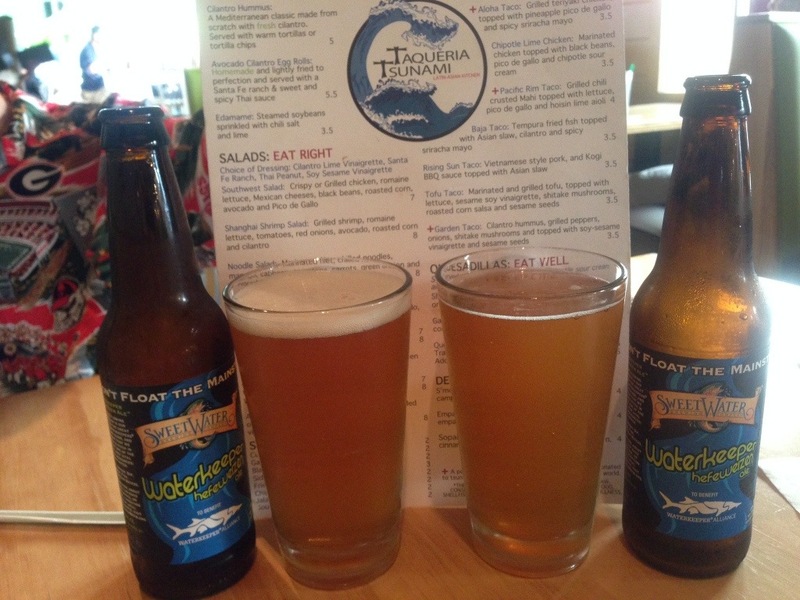 Pair it with a Sweetwater Riverkeeper and you have a good start. The beer list, however is pretty uninspiring. We don’t know what it is going to take to get some of these restaurants into the 21st century and out of the early 1990’s. Mexican and Asian restaurants are the worst offenders, so we are not surprised, just disappointed. There are mixed drinks that go by that look good and sangria as well. At least you have a choice once you see that beer list. 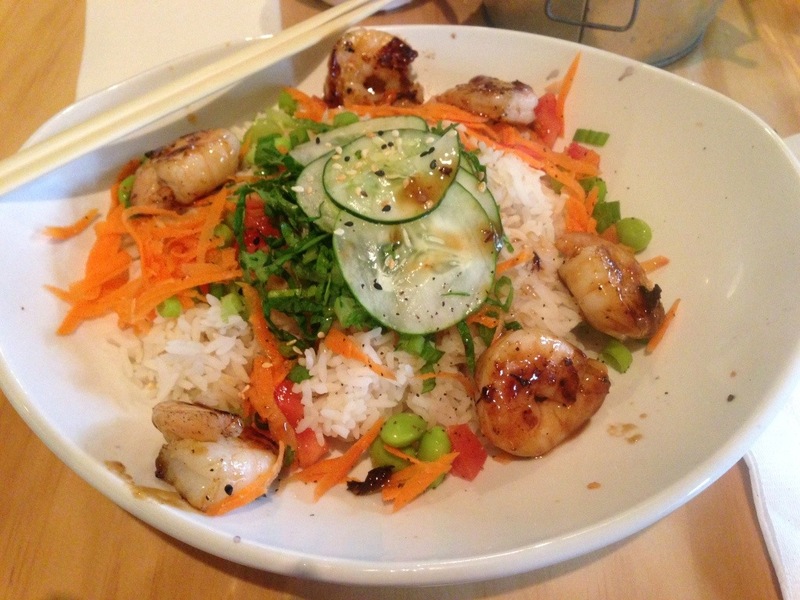 Eve orders the Far East Bowl and adds shrimp. This hearty bowl has a lot of food for $8. It’s all fresh and very tasty. Since we are in a taqueria, I order three soft tacos from that part of the menu. I try to mix up the Latin and the Asian. 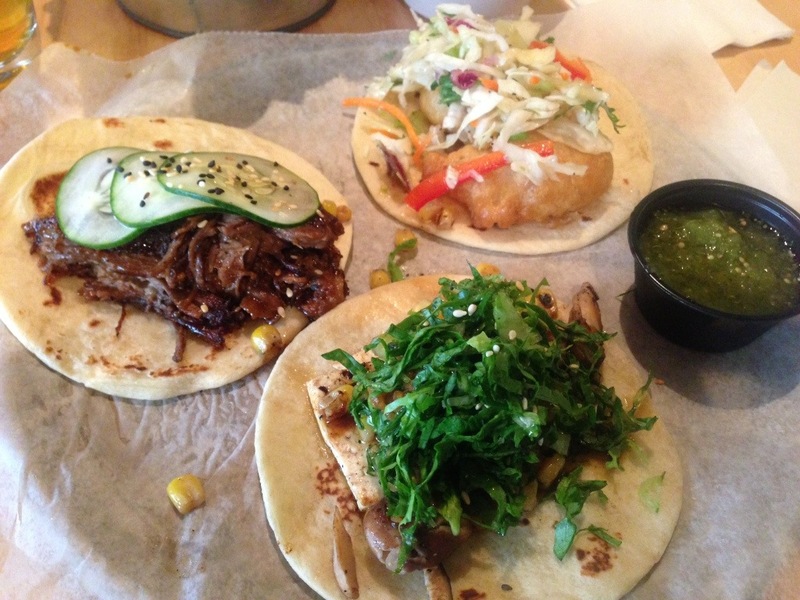 Starting from the 11:00 position and going clockwise is the short rib taco. You get a lot of meat in this taco. It is a little dry and could have used more of the BBQ sauce that it is cooked in. Next is the tempura shrimp taco, their best seller. Plump shrimp and Asian slaw make up this taco. It is my favorite of the three. The nicely breaded shrimp are the star of the dish. This is a must-order if you go. Finally, I go healthy with the tofu taco. This one’s a winner too with shiitake mushroom and corn salsa. This is a big plate of food, but I feel that it’s my duty to research these dishes for our readers who expect this kind of investigative reporting from the Date Night team. By the way, chips are not included, but you can get this cute bucket of them for two dollars. Some of the “sides” there are delicious, did you try any?